The Tokay Gecko is a noisy and aggressive species, but is very attractive looking. They are a Show Gecko rather then a species to handle as they will bite and this is very painful. 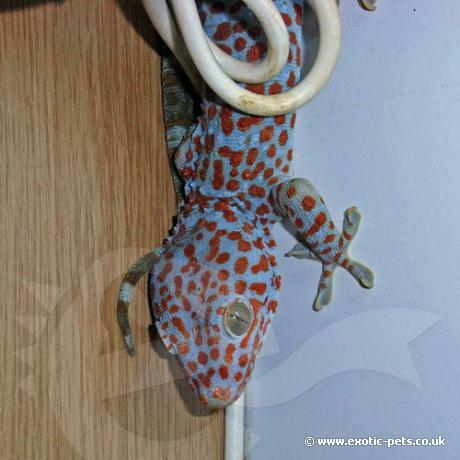 What does a Tokay Gecko look like? One of the largest species of Gecko with adults growing to 255-355mm (8-14 inches), hatchlings are approx. 100mm (4 inches). They are brightly coloured with a grey/blue background with red/orange and light blue spots over the body. Due to them being nocturnal, they have large eyes to help hunt for prey during the night. With adhesive pads on their toes, they can climb on pretty much any surface. The name of the Tokay Gecko comes from the sound that it makes during the breeding season "To-kay". They are very vocal with a number of barks and grunts - this can take you by surprise if you are not expecting it. Showing the inside of the mouth while doing this puts you off going near them and it should, they have a painful bite! Where are Tokay Geckos from? Although found in human habitats, they usually inhabit rainforests in Asia. Although this species is mainly nocturnal, only coming out 30 minutes before the lights turn off, they still need a basking spot. This should be at least 32C (90F) under the lamp with a cool end not going below 27C (80F). A drop down to room temperature during the night will be fine, on average it's an 8C (15F) drop. Spray the viv at least twice each day to help keep the humidity between 70-90%, never let it drop below 50%, this also allows the Gecko to drink. I always provide a humidity hide to help during shedding of the old skin. Are Tokay Geckos easy to keep? Tokay Geckos are arboreal, meaning they need more height rather then floor space. The best substrate to use is part potting soil and child's play sand covered with bark chippings. This species appreciates a well-planted viv with plenty of branches and covering, also add a few hides. As stated above, you need to spray the viv a few times each day to keep the humidity high, but most importantly for the Geckos to drink! You can keep these together in groups, but only one male for several females as these will fight to the death! A varied diet of insects should be offered, with the odd pinkie (baby mouse) offered to adults. Feed adults every other day and dust the food with a supplement at least once a week. For young and juvenile Tokay Geckos, feed every day with the appropriate sized food and dust more often.